When Curiot moved back to Mexico a decade ago, he was deeply inspired by the country’s culture. 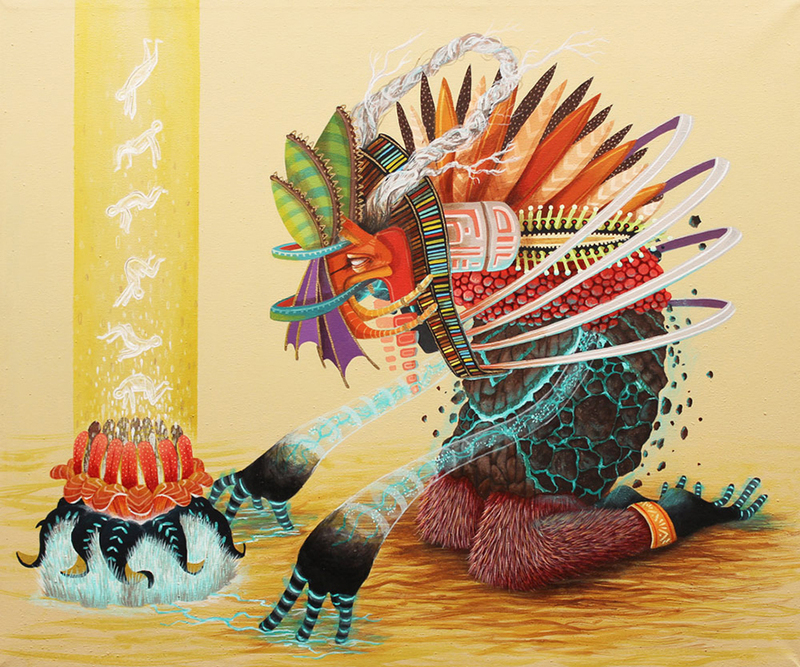 “The bright colors, folklore, and the beautiful handcrafts are some of the things that I embraced,” says the artist, who was born in Michoacán, but grew up in Costa Mesa, California. 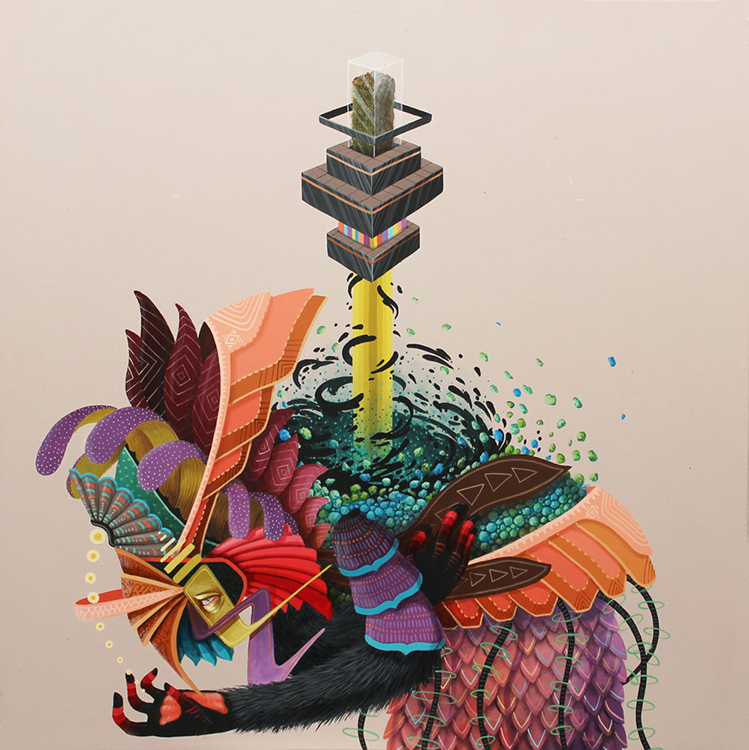 Curiot embraced the culture and then translated it into his own art, creating large-scale murals of mythological creatures that combine a vibrant palette, geometric shapes, and Aztec imagery. “These creatures began as simple strange animals and slowly became more complicated and a bit abstract,” he explains. His work recalls that of master animator Hayao Miyazaki even though the two deal in different mediums and cultures, because both have created fantastic and modern reinterpretations of traditional mythology, and speak about the careful balance between man and nature. In the following interview with The Hundreds, we talk to Curiot about culture, California, mythology, Mexico and more. ZIO: Where are you originally from? What was it like growing up there? CURIOT: I’m originally from Sahuayo, Michoacán, but I grew up in Costa Mesa, California. Who knows what I’d be up to nowadays if my parents hadn’t moved to the U.S. Growing up in Costa Mesa was great, I remember going to Disneyland a lot when I was a kid, and hitting up the garage sales on weekends in search of Nintendo games – I should still have those stashed away somewhere at my parents house. Junior high and high school were my full-on skateboarding years; that’s all I wanted to do back then. I still go skate but not as much as before. When did you move back to Mexico? After high school I was just trying to figure stuff out, didn’t really know what to do with my life, then I began to paint around the age of 20 and soon after decided that I needed a change and moved back to Mexico. I arrived at a city called Morelia, which is the capital of the state of Michoacán. This is where I would study art and develop my style. A couple of years after I finished art school, I took a chance and moved out here to Mexico City to see if I could make a living from art. I’ve now been here for three-and-a-half years and it worked out for me, but now I feel a change growing inside me again so I’m in search of a new city to explore. You said you studied art in Morelia. How did art school affect your style? How else did you develop it? I began as a self-taught artist but after a couple of years I realized I wanted to learn more, so I attended an art school in Morelia, Michoacán. It’s a small and traditional school but it gave me the foundation I needed to create my work. My style has developed from a combination of practice, hard work, and personal life experiences, but most importantly, from a lot of experimenting. I’ve had different styles over the years, sometimes they are very subtle evolutions and other times it’s a sudden change that is born within the series I’ll be working on at the moment. How do you think Mexico in general has influenced your style? Mexico is very colorful and rich in culture, and I feel that both of these characteristics have shaped my style over the years. Whenever I see good handcrafts, it makes me want to head to the studio and create something. What do you love most about Mexico City? What are a few of your favorite places there? I love that there is always something to do here and that there’s so many museums and galleries so you can always find something interesting to look at. One of my favorite places is the Anthropology museum, such amazing stuff there. Your murals often consist of mythical characters. How do you develop these characters? These creatures began as simple strange animals and slowly became more complicated and a bit abstract. I usually begin by sketching out the position I would like them to be in. From there, I start designing the mask using basic geometric shapes and then everything else falls into place after that. The themes tend to change depending on the series, but for the past three years it’s been the relationship between man and nature – a reminder of the importance of the natural world. Also, an appreciation for traditional and Mexican folk art. Who or what are your biggest inspirations? Two things: First, the work from other artists, and second, life in general. It has so many ways of surprising you that you change, learn, and evolve. 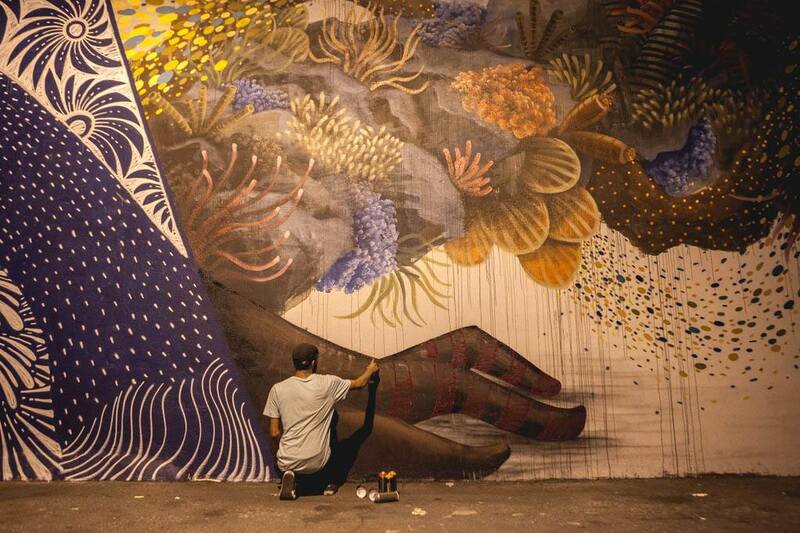 You created a fantastic mural with the Low Bros in 2013. What projects from your past are you most proud of and why? 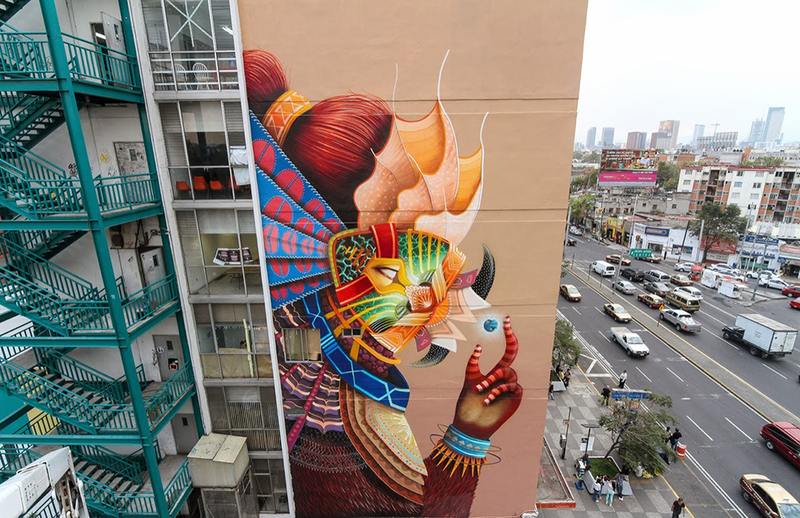 It would probably be the seven-story building that I painted here in Mexico City. I was going to project my sketch on the wall because I had never painted something so tall before, but we couldn’t get it to work so I ended having to free hand the piece. There were also various logistic problems I had to deal with, but in the end my friend and I managed to get it done. Keep up with Curiot on his Facebook.